"If you like a more traditional tasting turkey, this is the one for you. No injecting, no marinades, no complicated rubs." Heat oil in a large stockpot or turkey fryer to 350 degrees F (175 degrees C). Make sure the fryer is located outdoors in a safe area, preferably on dirt or pavement, and far away from buildings, wooden decks, or other objects. Keep a fire extinguisher handy, just in case. Ensure that the turkey is completely thawed. Cut any extra skin away from the neck area and make sure neck hole is at least an inch in diameter. Pat the bird completely dry with paper towels, then rub liberally with salt and pepper on both the outside and the inside. Place the turkey into a drain basket, neck-side first. Working slowly and carefully, gently lower the basket into the hot oil to completely cover the turkey. Maintain the temperature of the oil at 350 degrees F (175 degrees C), and cook turkey for 3 1/2 minutes per pound, about 35 minutes. Carefully remove basket from oil, and insert a meat thermometer into the thickest part of the thigh; the internal temperature must be 180 degrees F (80 degrees C). Once the turkey is done, remove from the oil, and allow to rest for 15 minutes before slicing. Cooked it for a bachelor party, turned out great. easy peasy. 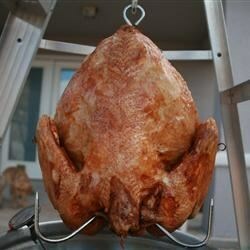 I love deep frying turkey, to me, its better then oven roasted. I fry 4-5 turkeys a year, friends and family love it.